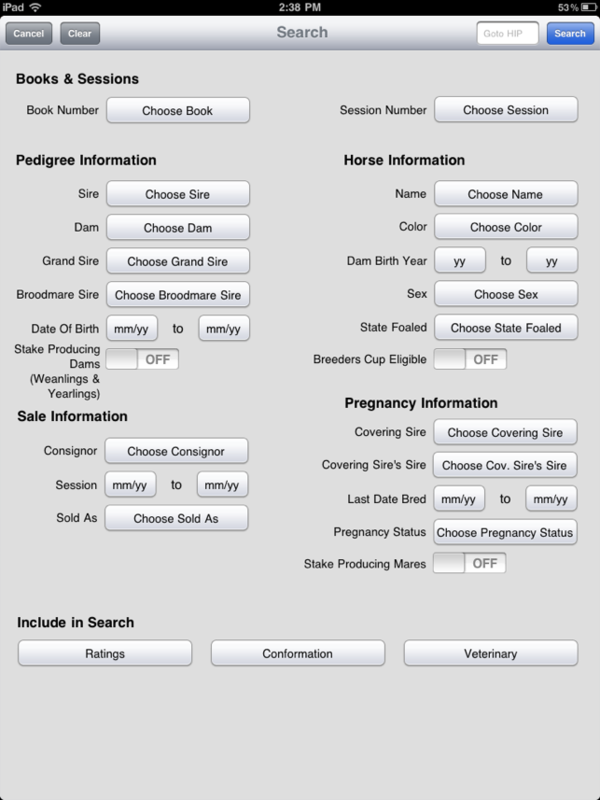 Equineline Sales Catalog is a powerful tool any potential buyer at Thoroughbred, Quarter Horse and Standardbred auctions will find extremely useful. 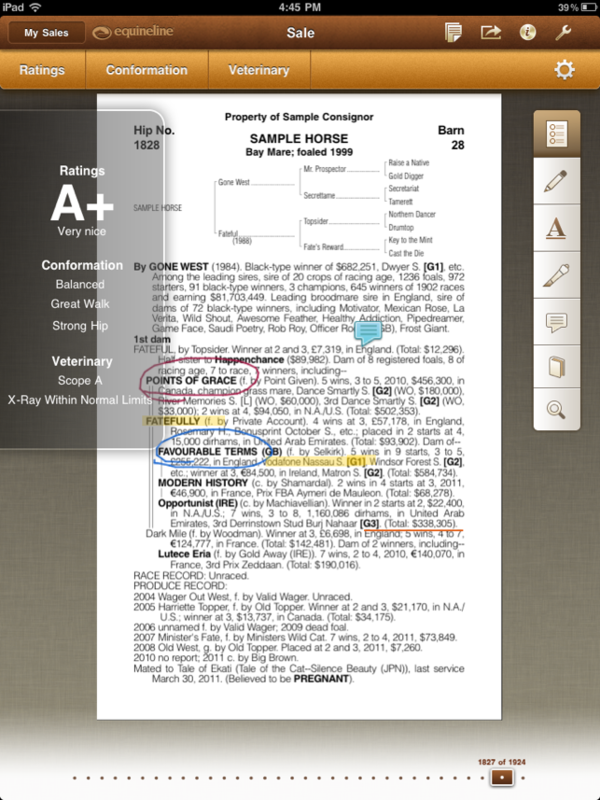 This unique app loads sales catalogs to your iPad, then allows you to record notes normally hand-written in the printed sales catalog, and provides innovative search, sort and rating capabilities. Move easily around the sales catalog, one page at a time or directly to a desired page. 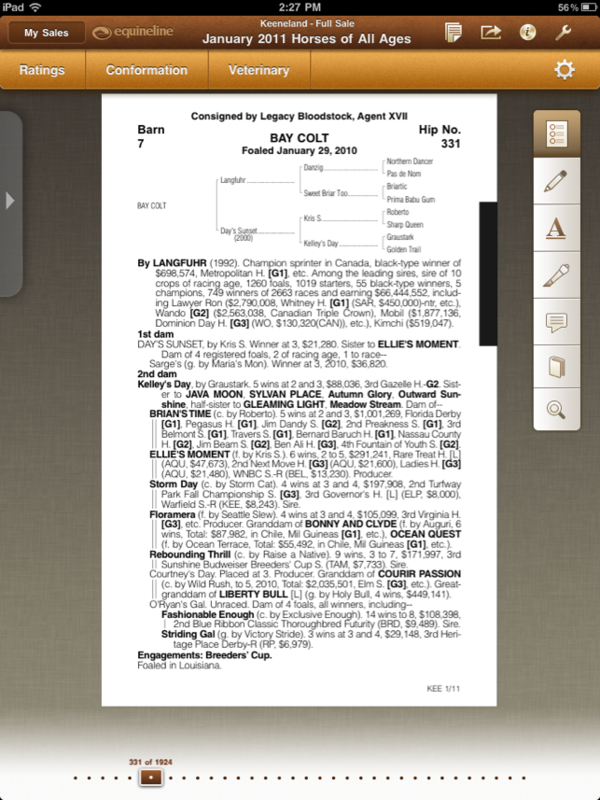 View the various sale indexes (Sire, Dam, Consignor, etc.) and go directly to the selected page. 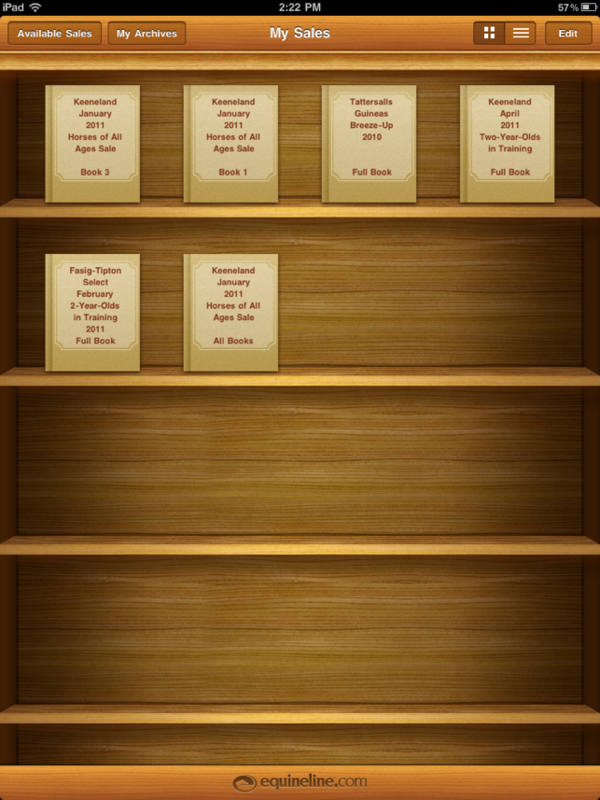 Archive the sales catalogs with your notes, ratings, etc. upon the completion of the sale and view at anytime. Minor Annotation change and bug fixes. This app is great. I am a regular horse buyer and work every sale to the bone. 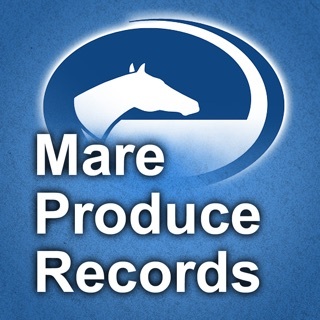 This app just made looking at horses 10 times more efficient. It might just be the most useful app on your iPad if you frequent the sales. Great job for version 1.0. I can see a lot more bells and whistles to be added though. 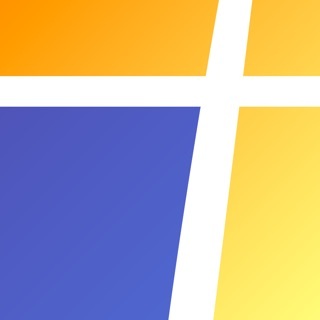 Simplest would be a sales calendar and info sharing with your sales team. 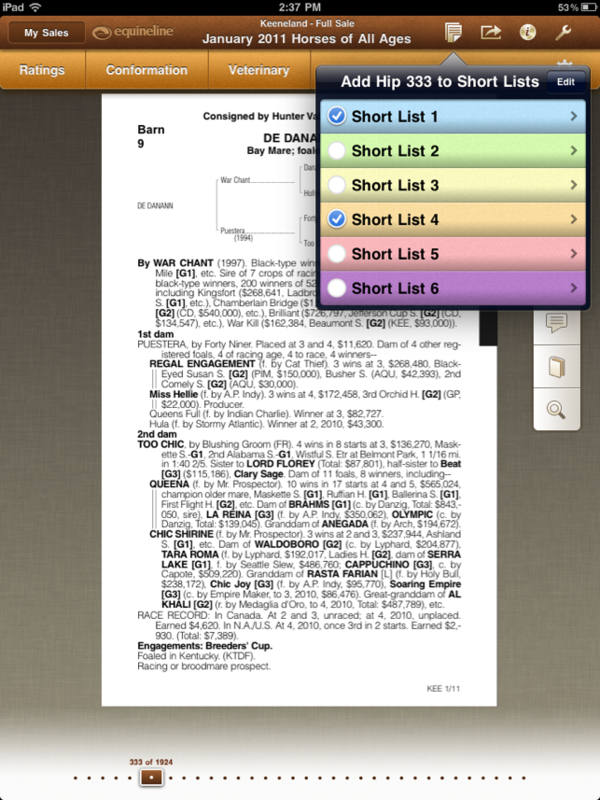 This is a very handy app- I can't wait to use it at the Keeneland September Sale. Much easier to navigate me manage than the printed catalogs. My only wish is that there were an easier way to access your created "short list"- as far as I can figure out, the only way to access is when you add a new horse to the list...? 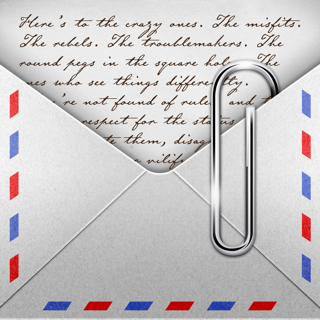 You can easily access short lists from any catalog page by tapping on the short list icon and then tapping on the appropriate short list name. This will not add the current hip to the short list.